Blood flow can be quantified noninvasively by phase-contrast cine MRI (PC-MRI) in adults. Little is known about the accuracy of this measurement in patients with known atrial septal defect. In 25 patients with a type-II atrial septal defect, blood flow rate in the great vessels was determined by 1 Tesla PC-MRI and the ratio of pulmonary to aortic flow (Qp/Qs) was compared with Qp/Qs by oximetry requiring heart catheterization, performed before of an attempt of percutaneous closure of the defect. The interval between measurements was 11 ± 18 days (range 1–78 days). Mean Qp was 9.2 ± 3.3 l/min with PC-MRI, and 8.6 ± 4 l/min with catheterization (p = 0.57). Mean Qs was 4.8 ± 1.6 l/min with PC-MRI, and 4.5 ± 1.3 l/min with catheterization (p = 0.46). Qp/Qs ratio was 1.99 ± 0.72 with PC-MRI, and 1.96 ± 0.96 with catheterization (p = 0.92). The correlation analysis showed a good overlap between measurements (Qp: r = 0.65, p = 0.0004; Qs: r = 0.64, p = 0.0005; Qp/Qs ratio: r = 0.68, p = 0.0002), also confirmed by regression analysis (R2 = 0.42, p < 0.001 for Qp; R2 = 0.41, p = 0.001 for QS; R2 = 0.46, p < 0.001 for Qp/Qs ratio), and by the Bland-Altman statistical analysis for method comparison (see Figure 1). The interobserver variability was low. 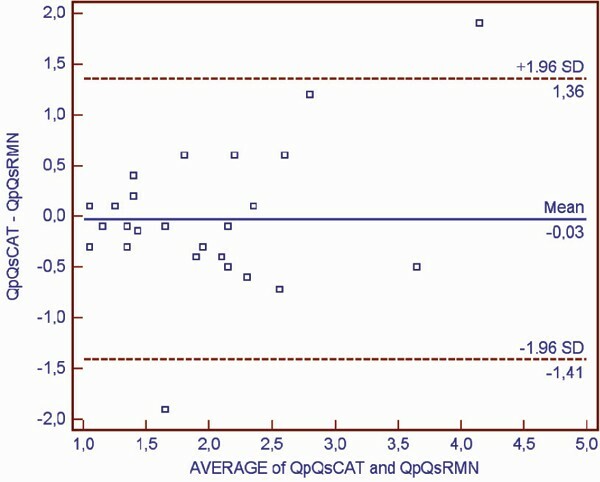 Determination of Qp/Qs ratio by PC-MRI is quick, safe, and reliable compared with oximetry. This noninvasive method could be used to quantify the interatrial shunt in patients with known atrial septal type-II defect, in order to demonstrate hemodinamic importance of the defect, and to reduce the need for time-consuming diagnostic heart catheterization.